The 264th Infantry Regiment, one of the 66th Infantry Division’s three infantry regiments, was now in France. 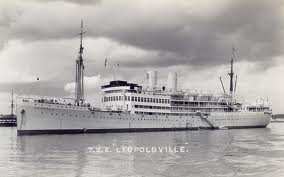 Its travel across the English Channel sadly proved eventful and costly when one of its transports, the SS Leopoldville, was torpedoed 5 ½ miles from Cherbourg on Christmas Eve 1944. The loss of life was great with 763 soldiers of the 66th Infantry Division, 209 of these soldiers men from the regiment, and 56 ship’s crewmen being lost. The regiment had initially formed and trained at Camp Blanding, Florida. It later re-stationed to Camp Robinson, Arkansas continuing its training. It again re-stationed to Camp Rucker, Alabama before shipping overseas to England in November 1944 arriving in Dorchester, England on 26 November. Once on the continent the regiment’s parent division was employed in the destruction of German units left behind as the main German forces withdrew from Northern France. As these operations developed, the 66th Infantry Division relieved the 94th Infantry Division in the Brittany-Loire area on December 29, 1944. Cooperating with Free French forces as operations progressed. Units of the 66th Division continually harassed German troop concentrations with limited objective attacks. Aggressive reconnaissance by Division units provided a steady flow of intelligence making these operations effective. As well, artillery fires were employed with good effect, weakening enemy positions and allowing the Division to tighten the noose on the now isolated German formations. These operations were intended to contain and reduce some 100,000 German troops that remained in the port areas of Lorient, St. Nazaire, Bordeaux and La Rochelle. In the developing situation a major German attack near La Croix was repulsed on April 16, 1945. Following the German attack, strongly fortified enemy positions were assaulted and taken by units of the Division between 19 and 29 April 1945. These actions hastened the capitulation of the remaining German forces in Northern France. The remnants of these German formations surrendered to 66th Infantry Division officers and French officials in a small cafe near Cordemais on May 8, 1945. 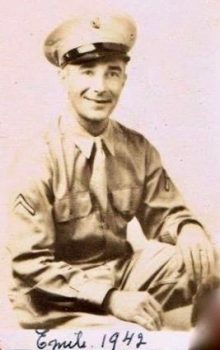 Sergeant, later Staff Sergeant Joseph E. “Emil” Couture assigned to Company C, 1st Battalion, 324th Infantry Regiment was a participant in these operations. Born in New England of Québécois stock he was a French speaker. 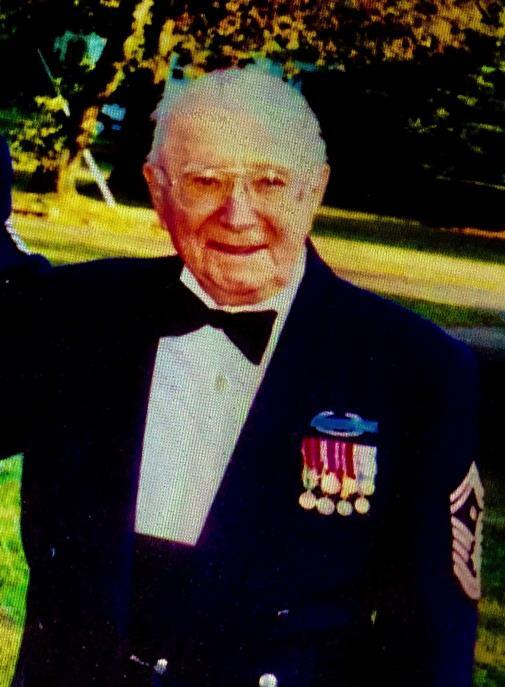 Emil Couture was married and working in the Hartford, Connecticut Area when he was inducted into the Army in 1942. He completed his basic training and was shortly afterwards assigned to the 324th Infantry at Camp Blanding, Florida. Older and more mature than many of his fellow soldiers, he early demonstrated leadership that his superiors recognized and he rapidly moved through the ranks assuming increased responsibility. By the time the 66th Division came ashore in France, Emil was a sergeant. Soon after the Division began it operational mission another mission was assigned. The Division was to assist in the formation and training of new Free French Army units. This duty could be much better supported in the case of American support with soldiers who were French speakers. 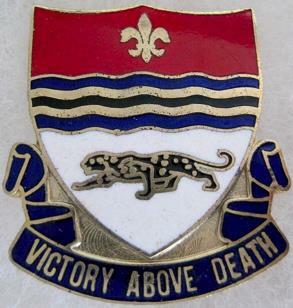 The Division, an Army of the United States formation manned and trained for the most part in the Southeast United States, drew its personnel from across the country though a majority came from the Southeast, Central Atlantic, Midwest and some from the Northeast. Almost all were primarily English speakers with a scattering of soldiers who had a facility with another language. The few French speakers, especially of a native variety such as soldiers from the Northeast who were Québécois in heritage and spoke French as a first language, were soon to become a very important part of the additional mission. Shortly after the division began operations in France in January 1945, the need for French speaking soldiers, preferably non-commissioned officers and officers to be identified and assigned to support the French unit training mission, was communicated across the Division. Sergeant Couture, already known by his battalion chain of command to be a French speaker, found himself detailed to the training duty. For an extended period of weeks, Sergeant Emil Couture found himself deeply engaged in the work of forming and assisting in the training of new Free French Army units. As a non-commissioned officer of now some experience, an older man who shared a related cultural connection and language with the French soldiers he was interfacing with, his assignment to this duty was of great benefit to the rapid development of new allied combat power. The work of forming the new French units was made much more efficient having U. S. soldiers proficient in the French language at the small unit tactical level of operations and administration. At one point in the operations in France, Sergeant Couture was able to visit with his wife’s uncle, Technician 5th Grade Alphonse Gagné, an Army musician with the 317th Army Services Forces Band in Paris. Both men being French speakers, they greatly enjoyed the town. 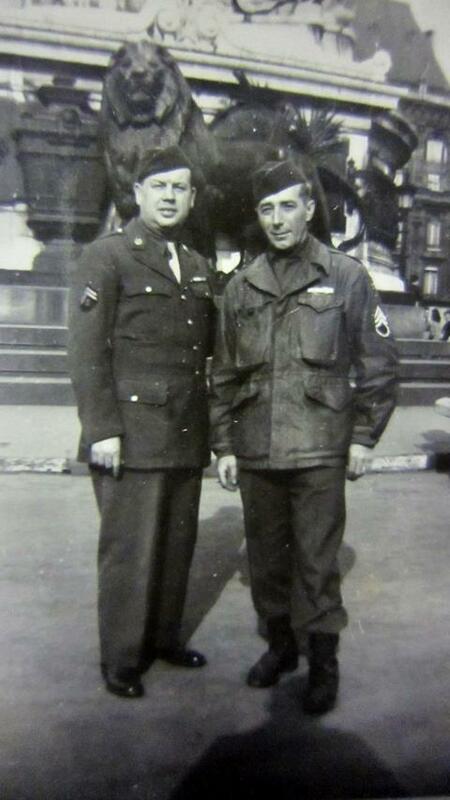 Technician 5th Grade Alphonse Gagné, 317th Army Service Forces Band, with niece Lorette’s husband Staff Sergeant Joseph “Emil” Couture in Paris in 1945. Operations continued in the 66th Infantry Division’s Area of Operations in Northern France. Then on 14 May 1945 the 66th Infantry Division assumed an occupation force mission. It moved 700 miles across France and Germany where it occupied 2400 square miles of territory and the city of Koblenz. As a security force, the Division’s mission was to establish a military government and effect control of all German affairs in this area. The division administered the disposition of German and other prisoners of war, inventoried munitions and supplies for disposition, and established organization for civil society. Subsequently the Division was relieved of these duties and returned to the French coastal area to assist with the withdrawal of allied forces from the European Theater. During this phase of the Division’s operational deployment to Europe it’s organization and composition were affected by the Army’s now activated demobilization process. The Division returned to the United States in late October 1945 deactivating shortly after its return. Staff Sergeant Emil Couture would on demobilization return to his wife in Connecticut and engage in a long and successful career as an insurance underwriter with the Aetna Insurance company in Hartford. He would also enter the Connecticut National Guard and with the formation of the separate Air Force in 1949 the Air Force National Guard. He would return to active duty when his Air Guard unit was mobilized for the Korean War by which time he had risen in rank to Air Force First Sergeant. Joseph E. Couture pictured in late career. On his Air Guard unit’s return to state service from Korean War service, First Sergeant Couture would resume his career with the Aetna insurance Company and he would continue his career in state service with the Connecticut Air National Guard. He would retire from the Air Guard as a First Sergeant. 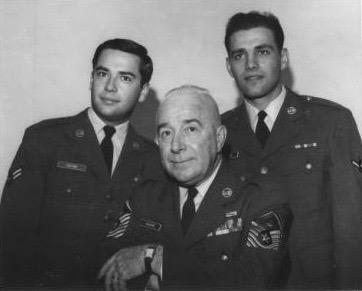 He would also raise two sons who would also make full time careers in the Air Guard rising to become senior non-commissioned officers. at a black tie military function. First Sergeant Emil Couture was a citizen soldier who met the call to duty and met it very well twice in his military career. A combat infantryman and infantry non-commissioned officer, he later pursued a long career in the Air National Guard retiring as a senior non-commissioned officer. He pursued a successful civilian professional career as well in the insurance industry. He was a successful parent and communicant at Saint. Paul’s Catholic Church for many years in Manchester, Connecticut. He was a leader on every level. both of whom would retire as senior non-commissioned officers. But for a number of weeks in 1945, he was not only a combat soldier in his nation’s Army but an ambassador of his country. 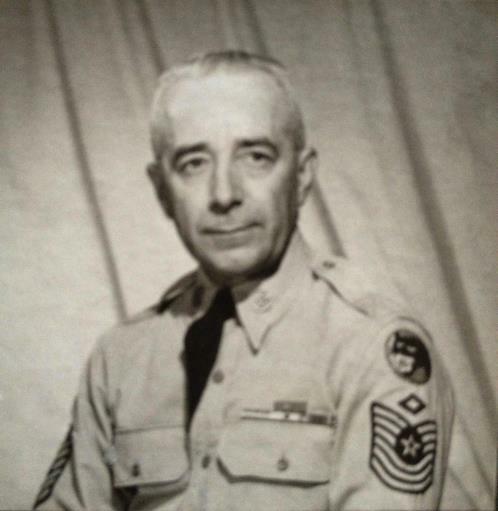 Because of a unique for an American cultural trait, he was a native French speaker of French heritage, Staff Sergeant Emil Couture was able to fulfill his role in the forming, training and equipping of new French Army units. As a very pointed leadership aspect, this vignette underscores the importance of every leader knowing as much about the people in their organizations as possible. It further emphasizes having a respect for the individual soldier, not only the demonstrated soldier skills, but the broader skills and abilities the soldier may possess, some that may be critical as demonstrated in this case. In this case, a soldier possessed the needed language skills, experience and leadership ability to perform an important and not initially anticipated mission and perform it well. 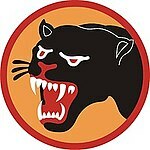 Note 1: aspects of the combat history of the 66th Infantry Division were developed from a Wikipedia article. Note 2: Emil Couture’s granddaughter carries on his service tradition as both of his sons did. She serves today as a field grade officer in the U.S. Air Force. Note 3: Emil Couture was the author’s uncle, married to his mother’s sister Lorette Boucher Couture. critical to retain language ability…being conversant in another language or two is in my experience of great benefit.